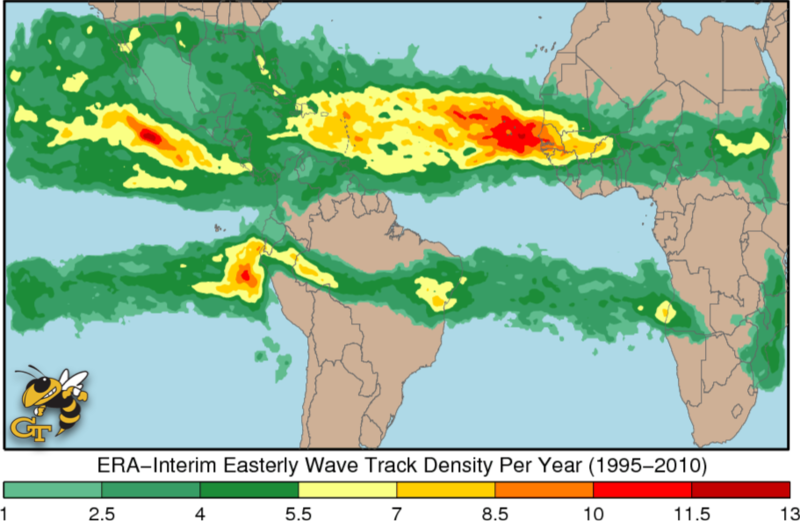 Easterly wave track density per year for the ERA-Interim reanalysis during the period June to November 1995-2010. The AEWC dataset was created using a new algorithm developed by researchers at Georgia Tech and represents the first attempt to produce a standard easterly wave tracking dataset for the East Pacific, Atlantic, and Africa. The algorithm uses curvature vorticity anomalies to identify the location of easterly waves as a function of time. The dataset provides 6-hourly coverage over a 63-year period (January 1948-December 2010) in the region bounded by 35S-35N x 140W-40E. Data files are derived using four separate atmospheric reanalysis products including: 1) the ERA-40 dataset (covers the period January 1958 to December 2001); 2) the ERA-Interim dataset (covers the period January 1979 to December 2010); the CFS-R dataset (covers the period January 1979 to December 2010); and the NCEP/NCAR I dataset (covers the period January 1948 to December 2010). Other data sources used in the production of the AEWC are the Remote Sensing Systems SSM/I Total Precipitable Water, Rain Rate, and Cloud Liquid Water content products, Claus Brightness Temperature, and Outgoing Longwave Radiation from the NCDC Daily OLR CDR. Each netCDF file contains all the easterly waves that originate in a given year, the isobaric level for easterly wave tracking (600hPa, 700hPa, and 850hPa) and the zone from which the easterly wave began its development. Zones include: Africa (AFR), Central America (CAM), North Atlantic (NAL), Northeast Pacific (NEP), South Atlantic (SAL), South America (SAM), Southeast Pacific (SEP), and Other (OTH). For each easterly wave, the following variables are provided including: wave observation count, wave trajectory id, wave time, wave trough centroid latitude, wave trough centroid longitude, wave trough maximum latitude, mean longitude of wave trough maximum latitude, wave trough minimum latitude, mean longitude of wave trough minimum latitude, wavelength, mean wave trough relative vorticity, maximum wave trough relative vorticity, minimum wave trough relative vorticity, standard deviation wave trough relative vorticity,mean wave trough curvature vorticity, maximum wave trough curvature vorticity, minimum wave trough curvature vorticity, standard deviation wave trough curvature vorticity, mean wave trough shear vorticity, maximum wave trough shear vorticity, minimum wave trough shear vorticity, standard deviation wave trough shear vorticity, mean wave trough Claus brightness temperature, standard deviation wave trough Claus brightness temperature, wave trough Claus brightness temperature area fraction, mean wave trough total precipitable water, standard deviation wave trough total precipitable water, wave trough total precipitable water area fraction, mean wave trough rain rate, standard deviation wave trough rain rate, wave trough rain rate area fraction, mean wave trough cloud liquid water, standard deviation wave trough cloud liquid water, wave trough cloud liquid water area fraction, mean wave trough outgoing longwave radiation, standard deviation wave trough outgoing longwave radiation, wave trough outgoing longwave radiation area fraction, mean wave trough outgoing longwave radiation anomaly, standard deviation wave trough outgoing longwave radiation anomaly. Cite as: Users must cite this dataset as: Belanger, James I., Jelinek, Mark T., Curry, Judith A. (2014): "African Easterly Wave Climatology, Version 1." NOAA National Centers for Environmental Information. [indicate subset used]. doi:10.7289/V5ZC80SX [Access Date].Cite this dataset when used as a source: Cite as: Belanger, James I., Jelinek, Mark T., Curry, Judith A. (2014): "African Easterly Wave Climatology, Version 1." NOAA National Centers for Environmental Information. [indicate subset used]. doi:10.7289/V5ZC80SX [Access Date]. Science paper associated with the dataset. Purpose The data will primarily be utilized by atmospheric scientists specializing in tropical meteorology. This may include studies of easterly wave genesis, intensification, and decay as well as the relationship between tropical cyclones and easterly waves. Cite as: Users must cite this dataset as: Belanger, James I., Jelinek, Mark T., Curry, Judith A. (2014): "African Easterly Wave Climatology, Version 1." NOAA National Centers for Environmental Information. [indicate subset used]. doi:10.7289/V5ZC80SX [Access Date]. Lineage Statement For more information about data creation, please review the associated documentation. Processing Environment Data are processed using MATLAB R2012a 64-bit with access to NetCDF 4.1.3.